"Scholarships are one of the most prevalent funding sources families use to help pay for college, but the key is knowing where to find them, and how to apply"
NEWARK, Del.--(BUSINESS WIRE)--Bargain hunters will spend November tracking down the newest Black Friday deals in order to save money on holiday shopping lists, but savvy higher education shoppers know November is also National Scholarship Month, a perfect time to find free money for college. Sallie Mae, the nation’s saving, planning, and paying for college company, has tips, tools, and free resources, to help students easily search and apply for scholarships. 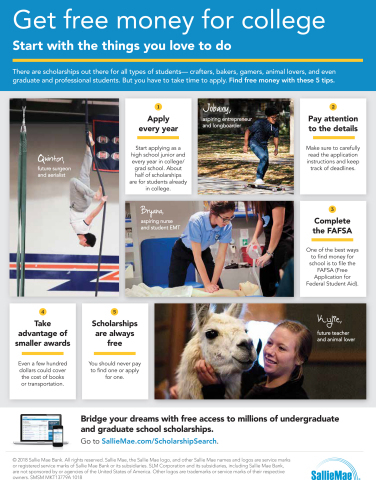 Sallie Mae’s Scholarship Search is free and home to 5 million scholarships collectively worth more than $24 billion. Students fill out a brief profile, and in minutes, the tool responds with matches that identify relevant scholarships, their award amounts, application requirements, and deadlines, and the tool automatically sends updates when it identifies new matches. Get an early start. Apply for scholarships in your junior year of high school and every year in college. Approximately 50 percent of available scholarships are for students already enrolled in college. There are also many scholarships available for graduate school. To help connect grad students with available scholarships, Sallie Mae recently launched its Graduate School Scholarship Search , home to 850,000 graduate school scholarships worth more than $1 billion. Don’t miss out. To qualify for $150 billion in financial aid, including scholarships, complete the Free Application for Federal Student Aid (FAFSA). Schools use the FAFSA to put together financial aid packages, states use it to determine eligibility for state aid, and it is required for many scholarship applications. Some aid is awarded on a first-come, first-served basis, or from programs with limited funds, so the earlier families fill out the FAFSA, the better the chance to be in line for that aid. Remember not everything is really a deal. Never pay for scholarships and be wary of “guaranteed” money. Don’t be lured in by sites or organizations that charge a fee to access scholarship applications. School counselors and school financial aid offices can recommend reputable options. Even small savings count. Many scholarships may just be for a few hundred dollars, but they can add up, and can be used for a variety of college expenses. Apply for as many as possible, and you’ll be surprised by how much you can earn. Take advantage of the doorbusters. Some scholarships awards are as easy as showing up and registering. Sallie Mae, for example, offers a $1,000 monthly sweepstakes for those who sign up for its free college planning tools. To commemorate National Scholarship Month, the company is increasing the award in November to $5,000. For official sweepstakes rules, visit the Sallie Mae $1,000 Monthly Sweepstakes. No purchase necessary. Void where prohibited. To help students craft an effective personal statement for scholarship applications, Sallie Mae and Ethan Sawyer — The College Essay Guy — will host a Facebook Live Event on Nov. 13 at 8 p.m. (EST). 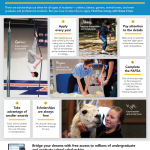 For additional tips on how to find and apply for scholarships, check out Sallie Mae’s scholarship visual. Register for Sallie Mae’s Scholarship Search or Graduate School Scholarship Search at SallieMae.com.